This is a particular unclassified release, there is no fight, no real objective or mission it's simply a practice field where you can choose you weapon and try to hit the targets during a certain time period. Design is quite well put together it's a tiny map but it's well squaled, the practice field and environment are well created could have perhaps be anhanced by some 40's music . It wasn't the case since your 'objective' is to have a good balance between shooting (has far as the taget is hit, how more you recieve points) concentrating and hitting the target which doesn't move with the same speed. 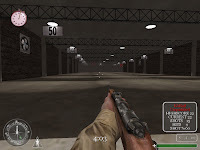 the pratice takes arround five minutes which seems to be long enough (perhaps even a little too long), after you recieve your score and if you have enough efficiency you will be graded, which also push you to restart or see if you have the same accuracy with another rifle. In conclusion:A quite surprising release that is certainly a good one to judge you accuracy or skill in shooting targets. It could be also be used on a server to play with you team and test you skill in a multiplay game.